Our newest desktop calendar is pretty and eco-friendly! 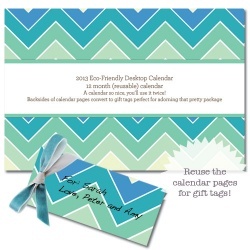 The backsides of our calendar pages convert into handy dandy gift tags ready for adorning that perfect package! Simply trim with scissors, add some twine or ribbon and voila! Gift tags galore! Calendar measures 4" x 6" and comes in a clear easel stand.